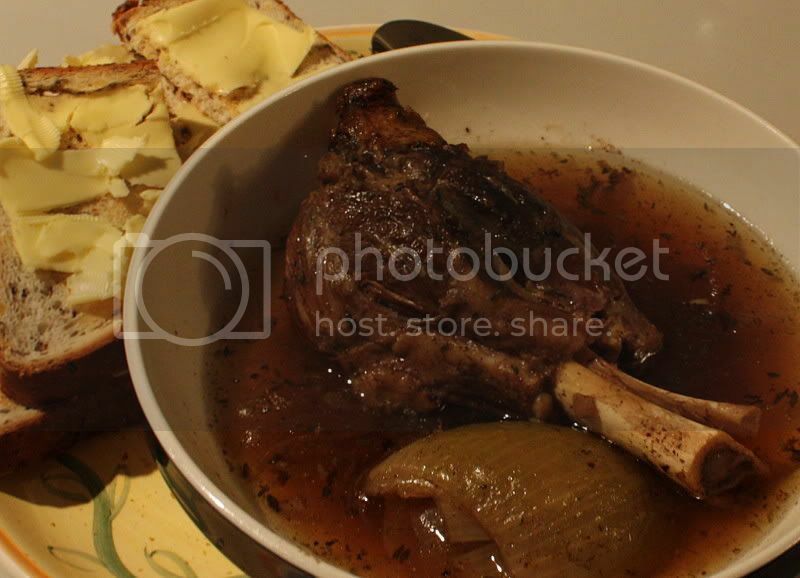 Lamb shanks cooked with onions, garlic, thyme and a smidge of leftover red wine, in the slow cooker for about 7 hours. So tender you can just about eat them with a straw. Also, bone marrow. Nom. You can't say you weren't warned though. You should have seen the fantastic jellylike stock they made too. People stopped asking us where our meat came from. We would answer much like, oh: "Samual" or "Wellington" or such. I need to remember, next year, to call or e-mail you when WUOT does their pet pledge drive -- their criterion is, "If it has a name, it's a pet", and I would feel delightfully chaotic making a pledge in the names of your goats. This one is Target, and this one is Curried, and this one is Chops. I've never cooked goat. Come to think of it, I don't think I've eaten it either. Well, Samual and Wellington were beef, not goat. Bubba Tut was goat. It is quite similar to venison, though as I recall that isn't often something eaten locally except in restaurants. Export crop for you folk. We went for a very long time without eating our goat, because what we had we might of eaten, we were selling. Not an export crop, but a cash one. Also, this brings a whole new layer of meaning to Pratchett's "Stoo with meat: 5p, Stoo with named meat: 10p"